Of all the novelists that you have read, which one appeals to you the most and for what literary and artistic reasons. Home » Jane Austen » Novel » Pride and Prejudice » Of all the novelists that you have read, which one appeals to you the most and for what literary and artistic reasons. I have read all the novels, included in my syllabus. In fact, I am a big fan of Earnest Hemingway because of his novel “The old man and the Sea” but when I studied Jane Austen and her novel “Pride and Prejudice”, I was much amused by her work. She is definitely the greatest of all. I am sure, she knows human nature very well. “Pride and Prejudice” is an example of it, in which she clearly shows the social norms of the society as well as people. I like Jane Austen because of her literary techniques, used in all of her novels. No matter, which novel you are studying, you will be amazed because of her literary techniques. It is not because these techniques are not common in every writer but because she has experience and knowledge that when and how to use them. It is because of these techniques, I like her novels. Let me tell you in detail that why I like her the most. First of all, as mentioned earlier, she is one of those writers who write about the reality of life. Her novels are realistic, which depicts the real picture of society. In her era, mostly the writers wrote about romances and imagination as well as utopian worlds but she was the one who took decision to write a realistic novel about human nature. We know that human nature is same everywhere. There may be a little difference in opinions and cultures but nature is same, no matter wherever you go in this world. This is what Jane Austen is well aware with. She is realistic and discusses human nature in detail and because of the usage of this technique, her novels appeal every person living in any corner of the world. In addition, she does not present the things as it is but as the writer imitates the nature and life, she also uses this technique but does not exaggerate it to be unbelievable. Moreover, every character in her novel is realistic. In this society, we can easily find characters like Elizabeth. Mr. Binglay, Mr. Darcy and even the nature of minor characters is discussed in detail. As his characters are real, therefore, they create a sense of amusement. For instance, Mrs. Bennet is a huge amusement for the readers. Her way of talking as well as actions attract the readers and keep them amused, which save them from boredom. Every character in the novel has his own qualities as well as drawbacks, minutely detailed by Jane Austen, which charms us the most. Secondly, Jane Austen is master in using the technique of irony. It is, in fact a weapon, in which she is trained. She uses it freely in her novels. In “Pride and Prejudice”, it can be realized that irony is a part of her novels. There are different types of ironies used in novels, written by her. For instance, irony of character, irony of situation, irony of dialogue etc. Mr. Darcy is proud but thinks that Elizabeth is a proud girl. In the same way, Elizabeth’s character is ironic. She also does the same as Mr. Darcy does. In an occasion, Elizabeth, in reply to Mr. Collins says that she is not the girl, who first says no and then yes but it is irony of situation that she first rejects Mr. Darcy but at the end accepts his proposal. Likewise, the opening lines of the novel are ironic. As we know that Irony is the difference between appearance and reality and because of this technique a slight but amazing suspense is created, which is presented in this novel. Apart from all above techniques, Jane Austen’s writing style is also worth mentioning. There is no element of ambiguity in her novels. Even a layman, who is not much sophisticated can read it very well. Her way of presenting, character, situations, dialogues and humour is superb. Her simple style makes her novels fresh and because of this technique we are discussing this novel. Hence, it is also a technique which compels me to like Jane Austen. As every writer has some limitations, and drawbacks, therefore, there are some allegations against Jane Austen that she is limited and her novels mainly concern with human nature. I am of the view that it is not a drawback of Jane Austen. She knows how to amuse her readers. She remains in four walls but her limited range is enough to write a superb novel. Thus, I must say that it is not a shortcoming but an exclusive technique of this writer, which makes her the best. At last but not the least, the characteristic, which Jane Austen have are not common in every one. She is a writer by birth. We cannot deny her masterly usage of these techniques. She amuses her readers with her limited but expertly usage of techniques. She knows about the society, especially about the human nature and as she feels in his mind about it, she makes an image in form of words. She, realistically describes her characters and uses irony to create a sense of delight in her novels.Her character depicting style is so prominent that, like other critics, I also falls in love with Elizabeth Bennet. Consequently, because of the ingredients, discussed supra, Jane Austen is my favourite writer. 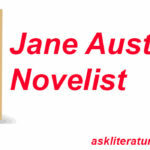 Tags: characteristics of jane austen novels jane austen biography jane austen theme of love and marriage jane austen themes jane austen writing style jane austen's view on marriage language and style of jane austen what kind of writer is jane austen? Jane Austen has used Irony as a part of her narrative technique. Illustrate this from her novel Pride and Prejudice. Discuss in what ways Jane Austen develops the link between marriage and money in Pride and Prejudice.